As an addition to real accessories there are many artificial ones which can contribute to the aesthetic appeal as well. 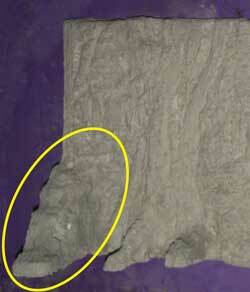 This article goes through how to make fake rock walls for your bearded dragons enclosure. However there are some issues to consider prior to building. Artificial walls can hide pathogens and parasites behind them…growing…constantly infecting, this can be quite hazardous to good health. Where the rock wall is to be permanently fitted ensure all edges are sealed to the enclosure with aquarium grade silicon. The surface of the walls should be sealed with a water-proofer to prevent growth of pathogens and aid in ease of cleaning. If the rock walls are to be removable then seal all sides of the walls to allow for ease of cleaning. 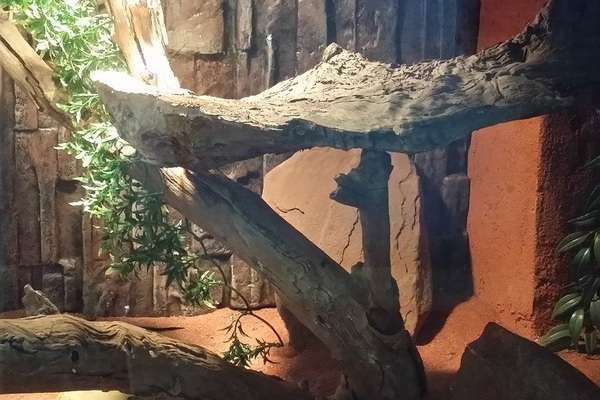 Remember to use some real rocks within your enclosure as well, natural rocks have properties that will provide value to your bearded dragon from basking to aiding in shedding. Polystyrene sheets – a couple of different thicknesses will provide more flexibility in design. Preferably 1 to 2 inch thicknesses. 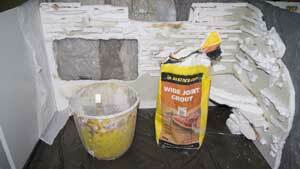 Grout – white or cream grout for wide joints. White or cream will allow for coloring the background. Knife or hot wire cutting tool. Hot wire cutting tools will cut down the mess and provide greater accuracy in detail, however a knife is effective and any defects can be corrected with grout. Paint brush and artist pallet knives are optional dependent on what you prefer to work with and level of detail required. Simply working with gloved hands can also produce good effects. 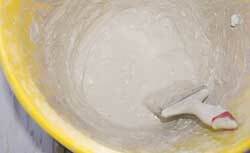 Bucket – Use a cheap bucket for mixing grout, it is unlikely you will want to use it for anything else again. Wooden skewers (cooking skewers) and or wire depending on whether there will be ledges that require support. If you have a tank or aquarium style of enclosure then the most logical choice is to create a removable background. However it can be fixed in place if desired. Removable walls must be measured to be at least a 1/2 inch smaller (finished size) than the entry point to place it in the enclosure. When cutting the main polystyrene background sheet allow for the depth of the grout it will be coated with (1/4 inch or so on each side). There is little more heartbreaking than to build a beautiful wall only to find it will not fit in when finished. Free standing rock walls must also provide their own support to stand, this can be done by adding sections of foam to the side of the walls to extend it far enough to stand on its own. If the enclosure is made out of melamine or similar material the walls can be built in place. Cut the polystyrene sheet to fit the wall snugly on the back wall cutting out any holes needed for cords, doors, etc. Cut an additional 1/4 to 1/2 inch or so around any area that requires a hole to allow for the depth of the grout which will cover it. Attach the background to the enclosure by gluing with no nails or similar strong glue. This can be done after the wall has been developed but if the polystyrene wall curves slightly whilst drying with grout on it then it will not sit flush against the enclosure wall. There are a number of ways to develop the background. Sections of polystyrene sheets can be glued on top of the back sheet and then cut and molded to the desired shapes by using a hot wire, or glue on additional pieces and then cut into them with a knife to achieve the required shape. To create a natural background the exposed edges of the polystyrene pieces glued on can be broken and roughed up, however keep the back of the pieces flat to provide a greater surface to glue onto the background. For any areas that will extend out of the wall more than a few inches (ie a ramp) add some wire support between layers of foam. The wire can extend past the ramp itself to allow enough to go through the back of the wall and attach it firmly. Once the wire has been pierced through the back piece, bend it down flat so it does not stick out. Gauge the amount of grout that will be required and that can be used within recommended times for the grouts (check the grout bag for work-ability duration). If unsure, make a small batch. It can always be added onto later. Mix the grout to a paste consistency, something that can be spread with a paint brush or by hand easily enough without dripping. Colors can be added at this stage however it will be a little less flexible in doing so. It is easier to apply colors to top layers of grout or applied to grout that is already in place. The grout is applied in a few layers. Apply the first layer, once dry apply a second one. Use a paint brush or your hand to apply the grout to the background. Add extra grout under any ledges or pieces extending out of the background by a few inches to provide additional support. The grout can be colored at this stage if desired to the main background color, however it can also be left the the last layer. Work on any areas with fine detail molding the grout into the required shape. Monitor the grout through the drying process, if it starts to crack very lightly mist the cracked area and work it back together by hand or with any of the tools being used if the detail is fine. Any areas with excess moisture may have a shiny smooth surface. Keep free standing rock walls flat during the drying process, any flexing will crack the grout and potentially even create a curve in the final product so that it will not sit flat against the wall. Rock walls being built in the enclosure simply need to be left to dry without movement. The last layer can be pre-colored or the coloring can be applied once the grout is in place whilst still wet. Where fine detail is involved it is best to pre-mix the color as it may become tedious keeping the shape and trying to work the color into the grout afterwards. However more detail through color variation can be created when the color dyes are put on top of the wet grout and worked in. If you do not like the finish that you have created, simply add another layer of grout and finish it again. 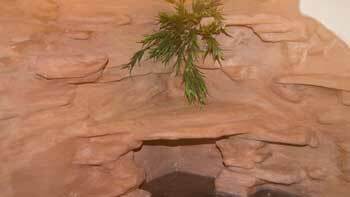 Finish off the rock wall with a water-proofer to aid in keeping the enclosure clean. Fitted rock walls can be sealed along all edges with aquarium grade silicon. 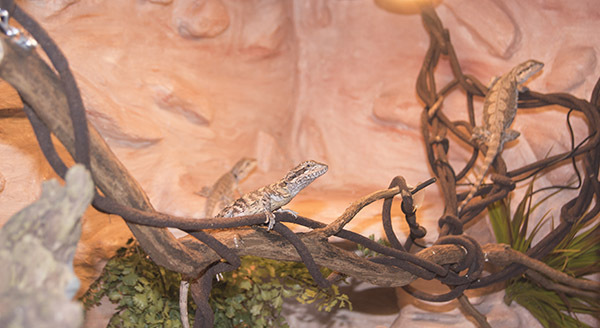 YouTube videos by Lizard Landscapes who do a brilliant job at explaining how to build fake rocks which can add to your enclosure, make walls or even a burrow. Cherokeekid304 (<-link to his YouTube channel) Give these guys a Like for their work while you are there for sharing their knowledge!